I'm back for Recap 3!!! 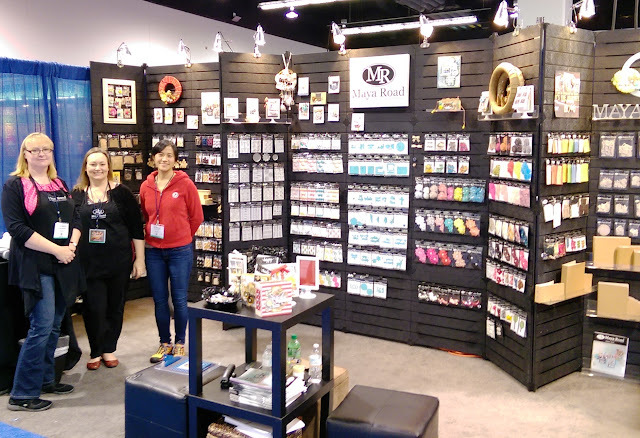 I was so fortunate to be able to demo for Eileen Hull in her Scotty Booth, and for Caroline Lau of Maya Road in the Designer's Showcase Booth. To say that I was busy while at the show, is an understatement, but I wouldn't have had it any other way. Thank you ladies for having me!!! This was the Scotty Booth. Talk about cute cute cute! You just wanted to plant yourself there and camp out a while! Eileen had lots of minions everywhere...Karen Bearse, Susie Bentz, Beth Watson....thanks ladies! 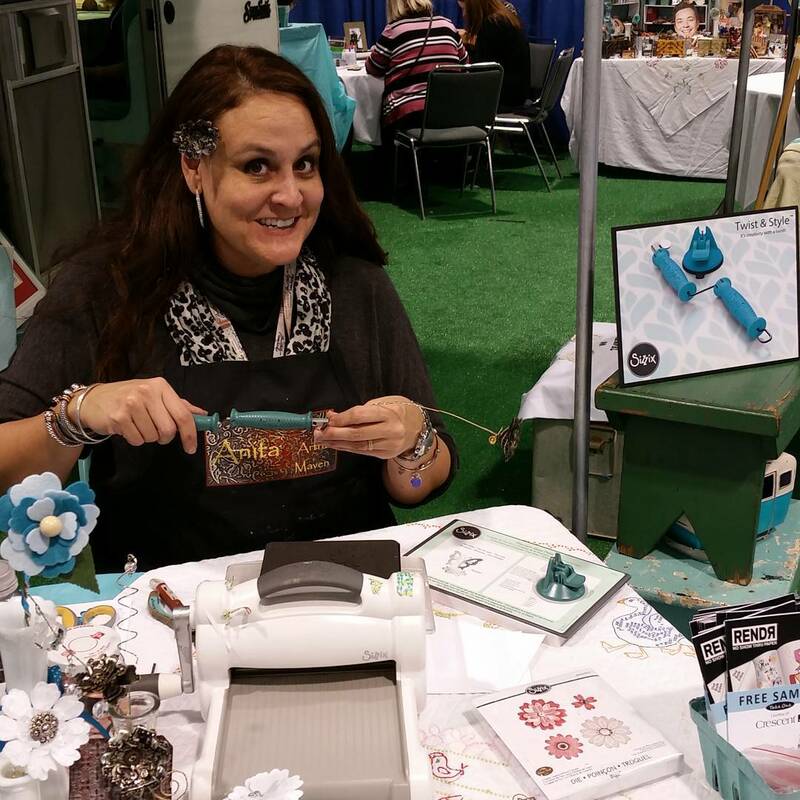 I demoed Eileen's new Twist and Style Tool. Talk about cool! You can twist wire, yarn, embroidering thread, just about any kind of string, into all kinds of stuff. I made earrings, flowers, tags, words, bracelets...I could have played with it for hours. Everyone was intrigued with it! I forgot to take better photos before I handed these to Eileen, and hopefully she has some, but I created a bouquet of steampunk flowers, and a metalicious tag with more flowers, using the tool and her new Heart Petal Flowers from Sizzix. 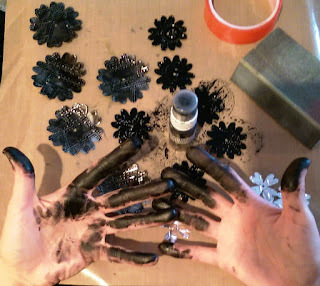 I did however take step out photos of how I created the flowers. 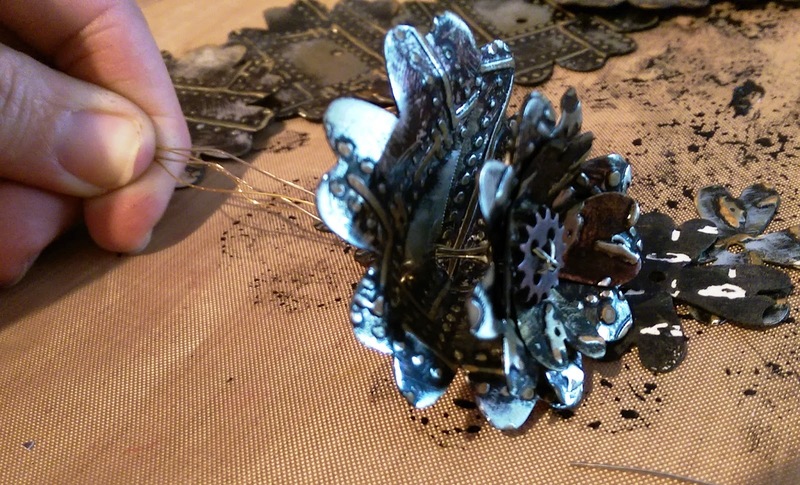 Her new die has three shapes of flowers that can nest together or use apart. 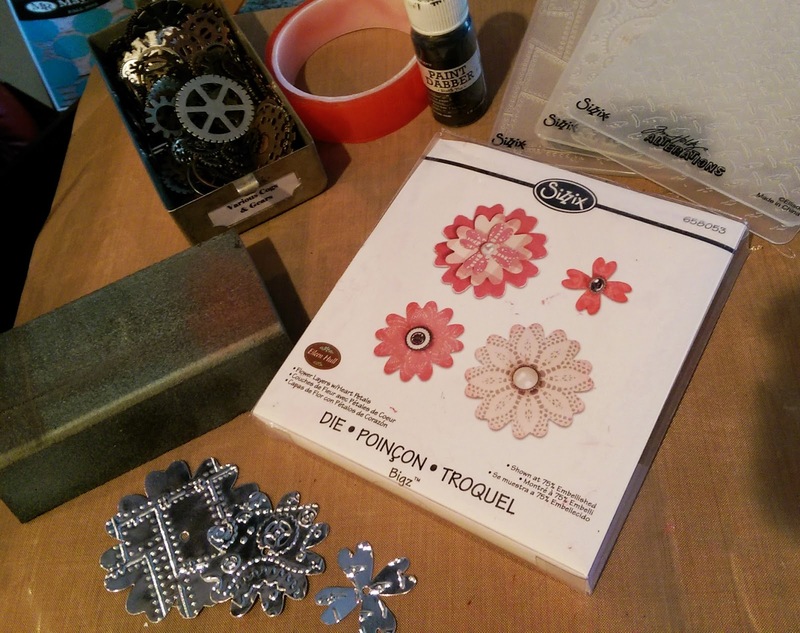 I cut die Ranger's Silver Cardstock using it, and then embossed the flowers with some of Tim's industrial looking Texture Fades from Sizzix. Then I got painty coating all of the flowers with Black Tie Paint Dabber. 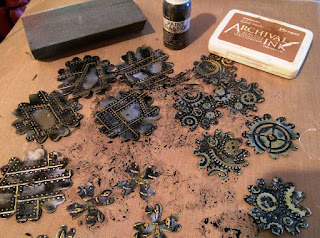 When they were dry, I sanded them a bit to reveal some of the silver. I also inked over the silver portions with Wendy's Tree Branch Archival. 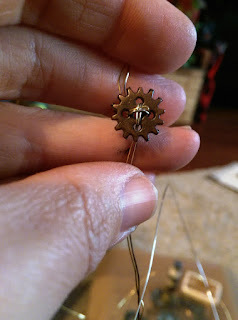 To prepare the stem, I doubled wire, and strung it through an Idea-ology Mini Gear, placing it in the center of my wire, that was cut about a yard long. I wanted the flowers to look a little fluted, so I cut a petal from each, and then fold them over and secured them with adhesive tape. I nested the flowers littlest to biggest and strung them on the wire, pushing them to the gear. Then I strung on a small gear charm that dangled underneath the flower. (NOTE: This is not what her new tool looks like. This was the actual prototype that she used to design hers, which is much better, has an anchor, and ergonomic handle...so cool!) 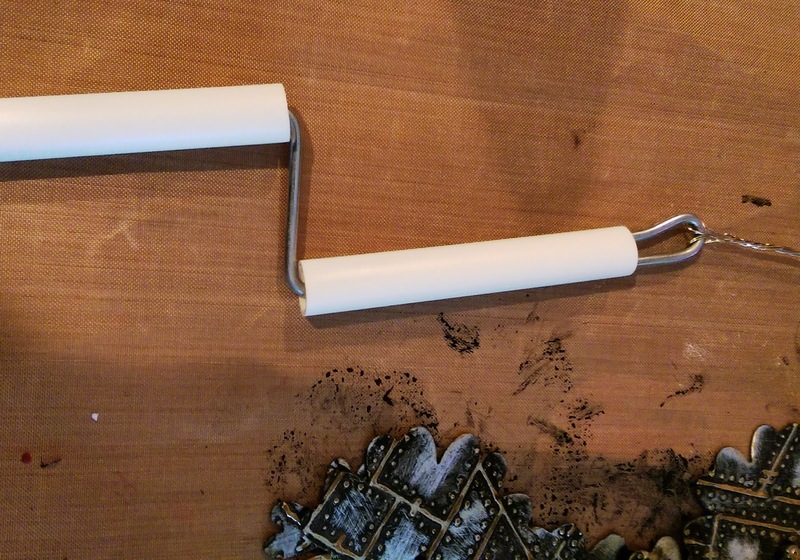 Then I placed the wire on the end of the tool, and held it in place while I turned the tool. This is a fuzzy photo, but the gold and silver wire was now twisted and had a look like rope..addicting! I even added jump rings while twisting the wire to create places to hang charms from. AND, I wrapped the twisted wire over a dowel to create loops to add to the bouquet. 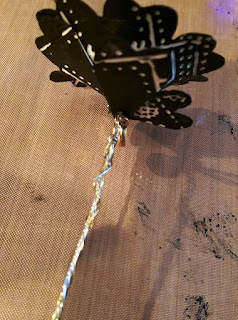 AND..I used the twisted wire to create the word 'Love' that I added to the tag (Not seen above.). Can you feel my excitement?!! 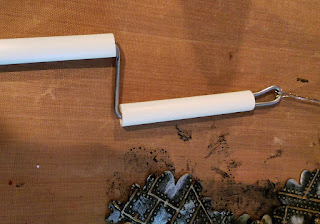 My mind was reeling with ideas for this tool...the possibilities are endless. It's super fun! Here is the Maya Road Booth, run by Caroline and her minions, Julia Stainton and Laura, and my bestie Carolyn, from The Crafty Scrapper (How I have no selfie of us is a mystery! ), was also her helper bee but not shown in this photo! Caroline came out with a whole bunch of new goodies and 26 new powdered coated steel dies, that are painted Tiffany Blue!!! 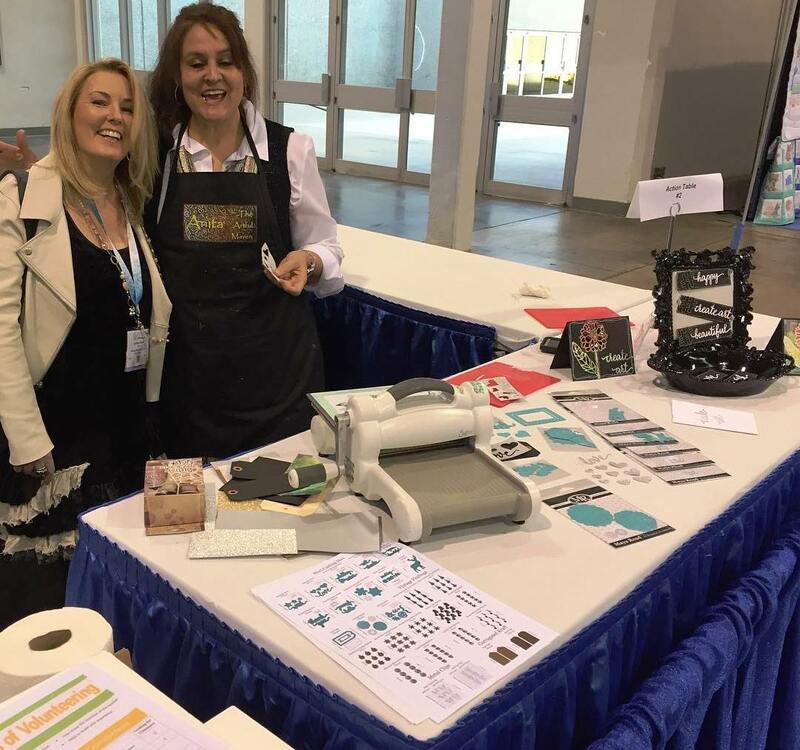 Here I am demoing the new dies, and my friend Johnna from Scrappy Camper Sisters came to watch and I couldn't open my eyes! Bad photo!!! 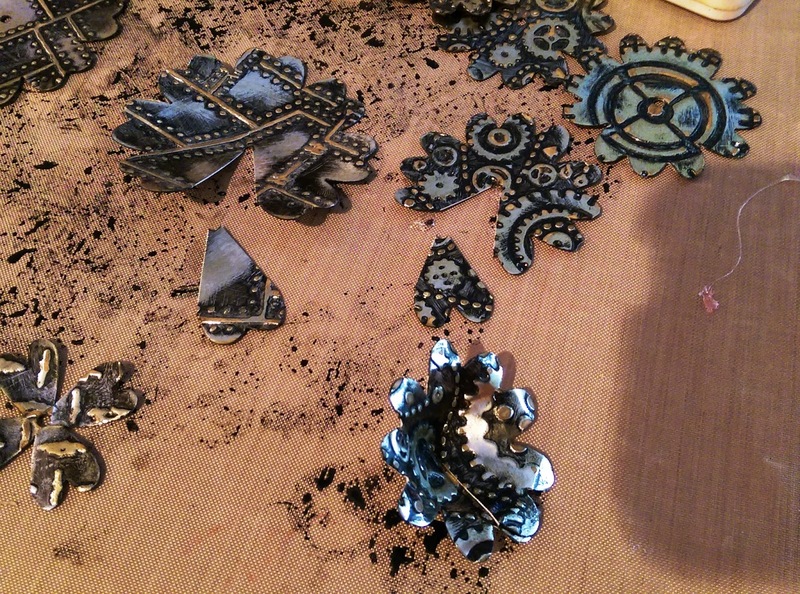 I demoed several dies, but my favorites are the mosaic looking flowers and all the fanciful font words. I made a few tags and cards, that you can sort of see, but of course I forgot to take photos. You can see the beautiful blue dies on the table. 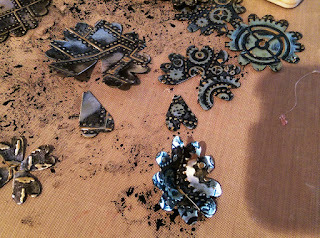 Funny story...well not really...Caroline came to video me demoing the dies, and I turned into a bumbling idiot. I guess I was nervous, and not to mention tired, because I even turned the base die plate backwards, couldn't get it to cut obviously, and it took me awhile to figure it out. Caroline had to stop filming three times, and we never got the video done. Talk about embarrassing! I'm so sorry Caroline! Let's do it again! I so wish I was there!!! Lookedlike so much fun and check out all the new toys I mean tools you got to play with!! I can't wait til their in the stores!!! Boy, oh boy... you must've been about the busiest person at the show (after Tim!)... so many brands and lines to demo and all of them lucky to have you there. Fantastic to share in some of the fun via these posts... one day, maybe one day, I'll get to come and see you in action in person. 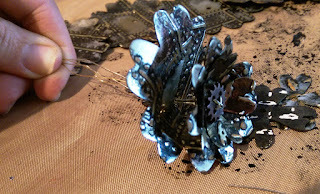 On those steampunk flowers are awesome! What a great project to share. Sure looks like one great time! Too bad it is not open to the GP as it would have been great to meet you! Happy Weekend! you were indeed a busy bee!! holy moly but how freakin exciting!! 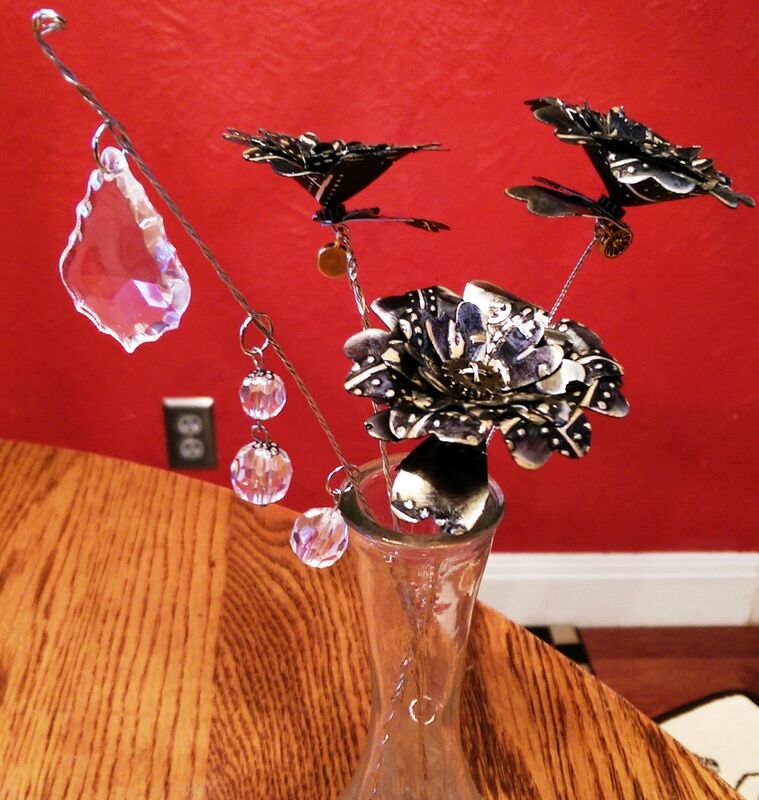 i love your flowers and i can't wait to get my own dies! 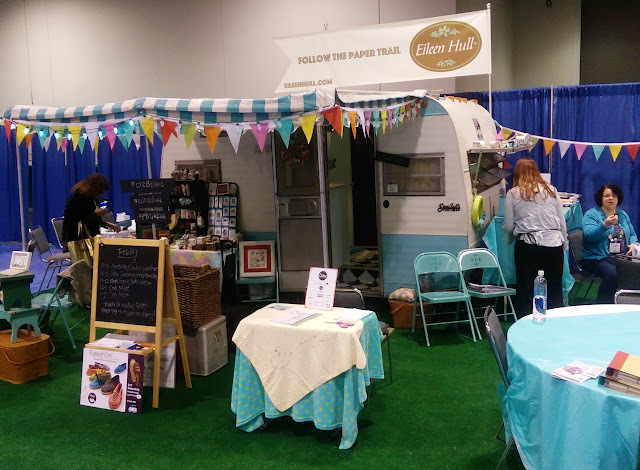 Definitely looked like a blast and yes I would be camped out by the trailer! 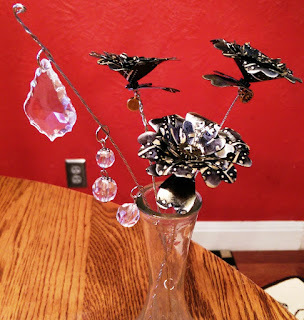 Those flowers are very cool and your twisting tool is cool! Looks like you had a great time Anita! Thanks for posting!!! YOU look ADORABLE and seeing all this makes me giddy. When can I get that twisty bendy thingy? Me likey!! First off love those cool grungy flowers! Thanks for the shout out!! It was great meeting you. 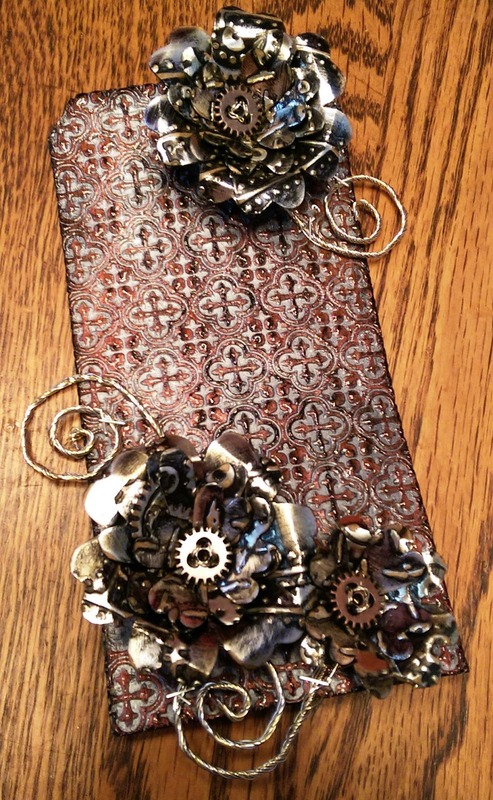 Loved your Steampunk Flowers with the gears but I somehow missed seeing the earrings! I am sure they are awesome! BTW - I am always happy to be your minion and personal photographer!